Where in the Alps was this photo taken ? Discussion in 'WW2 Battlefields Today' started by Owen, Oct 8, 2013. One of my favourite photos from the war. Soviet T34 & Sherman in The Alps somewhere . Anyone know exactly where it was taken ? I assume somewhere in Austria . I'd like to ID the mountain in the background & the village too. Maybe I could Then & Now it oneday. Been looking at lots of pics , can't find a match yet. Wonder if it in Slovenia ? if this is really in Austria, you could check with the following link or send an Email directly to their office ( office@alpenverein.at )and include the picture. All preferably in German. Or, send a private message to me and I will forward your request including the photo and the reasons for your interest. Tom , do you mean the mountain in the background to this pic? I need help identifying the name of it to compare. You've probably seen this one also from a series of WW2 colour photos which can be found everywhere on the web. The same mountains in the background with what looks like American troops being saluted by Russian officers. Maybe a clue there ...? Don't remember seeing that one before. Got name of photographer too. 9th Armored Div are the US unit. doesnt make sense as this page says they were in Czechoslovakia. So date & unit must be wrong in that other link. I am trying to get some confirmation from Austria. All photos look like having been shot in the summer when only pretty high mountians are snow covered. The mountains close to Wiener Neustadt are not that high. If you look from the area south of Linz in southern direction, I think you can see the snow covered peaks of the Tauern region from there. But lets see what my contacts in Austria come up with. Cheers Stefan, I've been looking at photos of lots of Austrian mountains, just can't find any to match yet. Some lovely scenery so it's not a chore. Nice find Owen and some wonderful background stories from Tom! Lt. Arnold E. Samuelson was with the 167th Signal Photographic Company. According to Wikipedia in 1945 he "was given command of Combat Assignment Unit #123. That unit consisted of two motion picture cameramen, John O'Brian and Edward Urban, and two still photographers, J Malan Heslop and Walter McDonald. Samuelson's group served initially with the 9th Armored Division, advancing as far as Leipzig, then was attached to the 80th Infantry Division as it moved southward to Bavaria and Austria." "Lt. Arnold Samuelson, of the U.S. Army Signal Corp Photo Div., joins in the Vodka party with the Russians. [Patron submitted inforamtion: Photograph taken in Liezen, Austria, where the meeting with Soviet forces took place near the bridge over the river Enns.]" So rather than Linz it's a location very close to Liezen, Austria. But I'm off to bed and work tomorrow so I'll leave it to you lads to narrow it down. pic on 80th Inf Div site of GIs & Soviets meeting up . see also what Takao forund on ww2f. 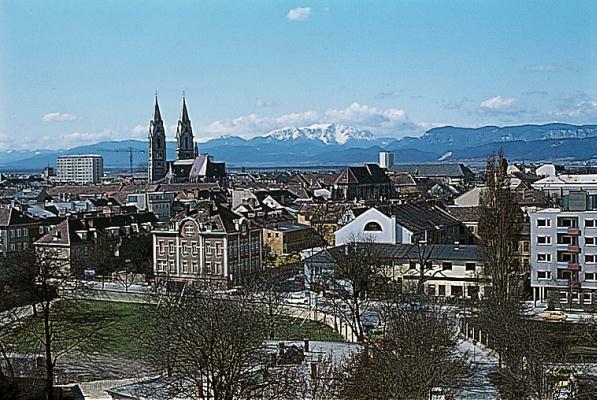 The series of photos were taken in Liezen, Austria - about 60-70 miles south of Linz, Germany. From photos I have found on the net it is the bridge where Schoberpass Strasse/Selzthaler Strasse/Route 113 crosses the river. Video of the event too.